I have yet to meet a noodle that pesto didn’t get along with. Come to think of it… I have yet to meet a noodle that I didn’t get along with. Strawberry Spinach Salad. With Goat Cheese. And Toasted Almonds. This salad is essential to my well being. At the end of a long day, this salad can make everything right. Without this salad, my life would not be the same. It makes me happy. I have to admit that sometimes I’m a bit jealous of other languages. They just sound more refined than the English language. This is my final honey recipe and it’s DESSERT! I hope you will make this SWEET dessert and serve it up with some SWEET words for your loved ones! Too often we use our words to tear each other down instead of building each other up. We focus on that which is lacking in one another instead of praising each other for our strengths. I grew up visiting the small town of Hendricks in farm-country Minnesota. One of my fondest memories was having my Grandma Caroline’s homemade rhubarb jam and pie… made with rhubarb straight from her garden no less! 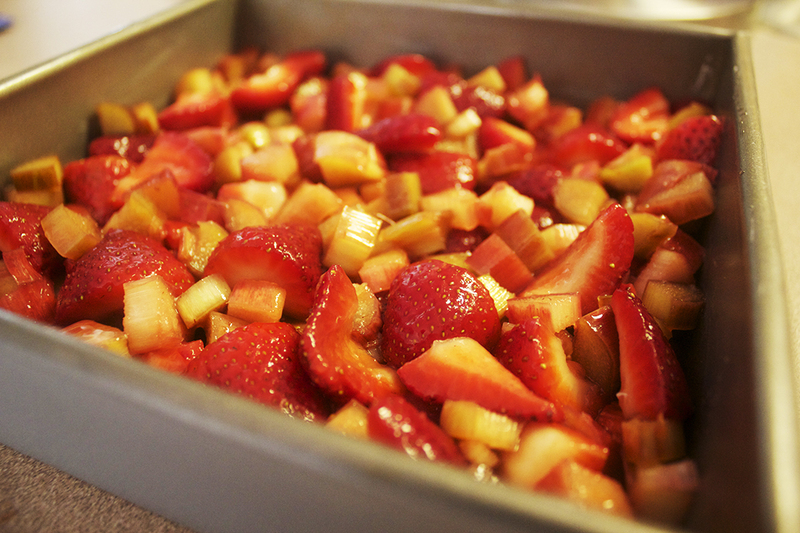 While I didn’t harvest my rhubarb from my backyard garden (I’m expecting my green thumb to arrive any day now…), I did pick up some from the grocery store along with some strawberries for this DELICIOUS dessert!